I said on Monday that I am not a native plant snob–and I truly mean that. In my “wildlife” garden, where I try to concentrate plants for pollinators and birds, I still have lots of non-native plants like hydrangeas, a couple of roses, a few shrubs and even some herbs (although when they flower, they too can be good for the pollinators). But when I buy native plants, I usually try to stick to “natives” that are as close to the species as possible. What do I mean by that? Let’s take a look at cone flowers as an example. The straight species of a cone flower is echinacea purpurea for the purple coneflower. And I’ve got lots of those in my garden. 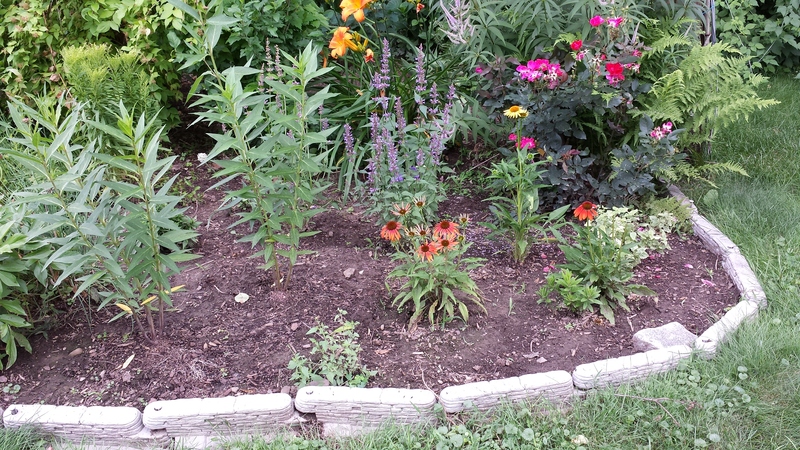 You saw that I planted some cultivars–technically “nativars” in my garden when I renovated it. They were called “Cherokee Spirit” and they come in shades of orange, yellow and red. I was trying to attract more pollinators to the garden with those colors and we know that bees and butterflies see in the color range of white, yellow, blue and purple. So by changing it up a bit and adding the yellow and orange to the garden, I was hopping to attract more bees and butterflies. As a reminder, here’s how that looks. What I don’t do, however, is plant “nativars” that stray too far from the original look of the plant. These lovely cone flowers are in a neighbor’s garden. And to be fair, she was planting for color and not for wildlife. But I can tell you, as I walk by these plants, I don’t see anything–bees or butterflies–on these plants. 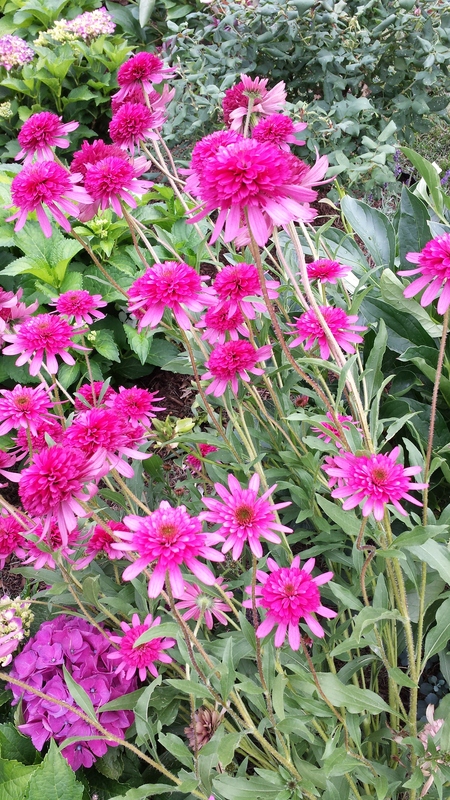 She’s actually got two patches of these–these dark pink and a lighter pink, as well as some traditional purple cone flowers. But while they are lovely to look at, they don’t form the traditional “cone” seed head that attracts the pollinators–and later the goldfinch which eats the seeds. So when you are choosing “nativars”–cultivars of native plants–decide your objective in planting. If it’s for show, by all means choose something as lovely as these double cone flowers. But if you want to help pollinators and feed birds, perhaps you might want to stick to the more old-fashioned looking cone flowers. oh wow, I hadn’t realised that! They are gorgeous flowers, though. I’m happy to say that most of the plants in my garden have bees and butterflies visiting them. Not so sure about the birds. I love having the wildlife addition to the garden! Thank you both for commenting. When I started the post, I wasn’t really even thinking of the Cherokee Spirit cone flowers as nativars but the more I thought about it I realized that even they were. So I’ve spent a good deal of time watching. The bees are clearly prefering the plain old purple ones for the moment. Whether that will change as the others grow remains to be seen. So hooray for the plain old natives, I guess.